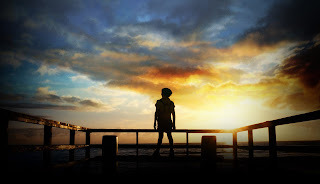 Release Date: April 24, 2015 – U.S.
After "Little Boy" was recommended to me by three people of wildly different backgrounds and interests, I knew it was a movie I had to see. I initially dismissed it based on the trailer, which is one of the most misleading in recent memory. It really does this fine film a disservice, by erroneously portraying the boy's beliefs as a magic act that literally allows him to move a mountain. (The notoriously deceptive trailer for the otherwise good "Bridge to Terabithia" is almost more honest.) Yes, it's said that faith the size of a mustard scene can move mountains, but the actual movie is thankfully more grounded in reality. Don't get me wrong: "Little Boy" is about faith. But it's the kind of faith we all live with every day, where believing isn't necessarily seeing. Pepper Flynt Busbee (Jakob Salvati) – who already has an uphill battle ahead of him with a name like that – is known as "Little Boy" around the small town of O'Hare, Texas, for various reasons: his young age (he's only 8), his short height and small stature, and – worst of all – it's an insult the local bullies shout at him when they aren't calling him a "midget" or trying to push him around. Dr. Fox (Kevin James, in a rare and surprising dramatic role) reassures him that the term "midget" is just a mean name for folks with dwarfism, but more time is needed before an official diagnosis can be made. This is really a ploy for him to get closer to Little Boy's mother, Emma (Emily Watson). The other members of Little Boy's family are his father, James (Michael Rapaport), and brother, London (David Henrie) – they really know how to name them in this family! His brother tries to enlist in the army, but his application is denied because he has flat feet – yet another reason I wouldn't be able to join the military! Because of that, his dad feels duty-bound to fight the good fight against the "Japs" – as they were disdainfully referred to back then. Little Boy's best – and only – friend is his dad, so the separation is devastating. Little Boy is easily influenced, as little boys sometimes are: he parrots hateful terms like "Jap" without understanding the full ramifications of what he's saying, and he feels conflicted by the "honor" of the atomic bomb being "named after him." At the behest of his older – but certainly not wiser – brother, Little Boy assists in vandalizing an older "Jap's" house. The "enemy's" name is Hashimoto (Cary-Hiroyuki Tagawa), but he's far from the "fresh off the boat" foreigner he's wrongfully perceived to be. As it turns out, he has actually lived in the United States for over forty years. Hashimoto is good friends with the local priest, Fr. Oliver (an endearing Tom Wilkinson). Little Boy eventually ends up in front of the wise clergyman, who hands him a piece of paper and instructs him to complete several tasks. The final – and most important – item on that list: "Befriend Hashimoto." Little Boy takes his mission seriously and does it dutifully, but progress with the older Japanese man is slow and unsteady at first. As their friendship tentatively progresses, they share an ice cream together outside the parlour. 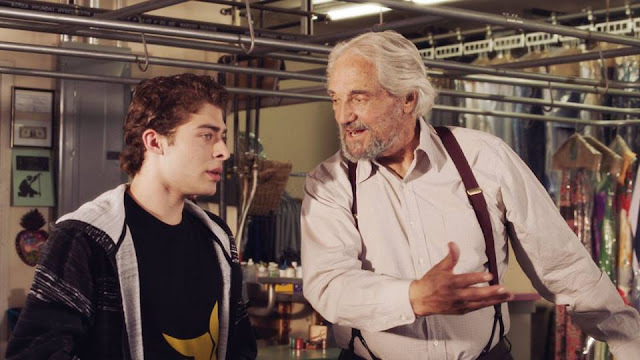 It's a scene that will both touch your heart and tickle your funny bone. Their growing bond is one of the most heartwarming aspects of this film. Unfortunately, trouble is always right around the corner. The tragedies of war have fueled irrational fear, hatred, and mistrust for Hashimoto in some of the townsfolk. Little Boy's brother misses their father, while the much older Sam (Ted Levine, who memorably played Captain Stottlemeyer on "Monk") is grieving for his son. They come together because they both have a bone to pick with "the Jap" – and they're not willing to make their point quietly. It's a twisted and toxic mirror image of the purer kinship shared by Hashimoto and Little Boy. What surprised me the most: "Little Boy's" wonderful visual flourishes. This is a stunning movie to look at! Early on, a person is shown siting on a bench holding up a magazine with Adolf Hitler on the cover – positioned in such a way that it almost looks like the Fuhrer's head is attached to the reader's body. It's a very clever sight gag. Later, we see a samurai sword-fight, which unfolds dramatically as Hashimoto reads a Japanese storybook to Little Boy. There's also a spectacular black-and-white dream sequence highlighted by bold red imagery. But the real reason the film works so well is because it's filled with great story and character details. In one scene, Little Boy has his height measured at home, with pencil markings on the wall to indicate his growth. It's a quiet little moment of great power that transported me right back to my own childhood.